We returned from China with dozens of souvenirs but just one treasure: our grandson, Will. The highlight of his one-way trip was his passage through U.S. Customs and Immigration at Los Angeles International Airport where he became a United States Citizen with no fuss, but with grateful tears from his new family. He is one of thousands Chinese children who are adopted annually but he was our singular reason for traveling to his home country. As the fortunate grandmother, I was there to meet him and to support his parents who traveled lightly going to China and juggled bottles and diapers, paperwork and toys on their return trip. 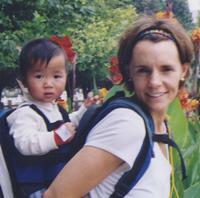 Adoption travelers are routine visitors in China. Their itineraries are closely prescribed and carefully coordinated to accommodate medical examinations, greeting ceremonies, group photos and visits to the U.S. Consulate. It’s about the babies and it’s the journey of a lifetime. Let me set the stage first by telling you the travel planning became earnest only after Match Day, the day when adoptive families receive a folder with a photo and basic information about their child. 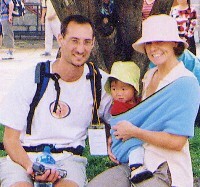 My husband and I had been invited to travel with our daughter and son-in-law. Dates are determined just weeks before departure. They were laughing when they called to tell us we’d be meeting a grandson in China. At least 95 percent of babies adopted from China are girls. We would be traveling to Yunnan Province to pick up a sweet 11-month-old baby boy who was pictured wearing a purple sweatshirt with flowers and lace and holding a basketball. Everything worked back from there: a group of 13 families would travel first to Hong Kong to meet the guides who would take us to Kunming, Yunnan. We spent a week there and a week in Guangzhou where adoptive families finalize documents. We flew from Chicago to Los Angeles several days before our scheduled group gathering in Hong Kong. We met Will’s parents, had dinner at the airport, and boarded a China Southern Airline where we took our premium economy seats which were the choice of the two 6-foot-plus men who both wanted leg room for the long trip to Guangzhou. In Guangzhou, a Lotus Tour greeter met us, got us to a taxi, came with us to the train station for our trip to Hong Kong, and attempted without success to gets us to buy breakfast at a McDonald’s. Instead, we proceeded to catch an early train and had a comfortable, interesting ride through the countryside where small farms peppered the route to the densely-populated Kowloon Island sector of Hong Kong. The trip was an exotic combination of hilly, lush countryside and industrial scenery. Our first hotel was amazing: The Kowloon Shangri-la Hotel. It is a slice of paradise. We were barely in our room when a hotel employee delivered a complimentary basket holding a pot of hot tea, tea cups and fresh peaches. All meals at the hotel were glamorous. Each venture outside was an adventure. On the walk to the Jade Market the streets were filled with upscale shopping but in the alleys street food was often for sale. In the short visit to Hong Kong, I managed a few hours at the Hong Kong Art Museum and we all walked 20 minutes to the Star Ferry to Stanley Market for a morning of shopping complete with bargaining with help from our Mandarin Chinese speaking daughter. We bought Will’s first silk Chinese suit there. Hong Kong bustled with construction. Victoria Harbor was full of traffic. The CCAI (Chinese Children Adoption International) group met in the hotel lobby to travel together for the flight to Kunming. Hong Kong Airport was huge and new. At the airport, travelers ordered their Starbucks drinks and said goodbye to English menus. Kunming was about a three-hour flight. It is centrally located in Yunnan Province and was the home to the American Flying Tigers during World War II. Old fighter jets were parked near the runways at the aging Kunming Airport. Squat toilets greeted us in the restrooms. Uniformed nurses checked travelers for fevers, we believe, fearing a spread of SARS. The city has 3 million-plus residents. The agency had not worked with the orphanage here for several years. We stayed at the Bank Hotel. New parents casually call the day they meet their babies “Gotcha Day.” There is nothing casual about it. Many of them have sent photos and clothing for the day to their babies in the hope the orphanage workers would share both with their children. There were three grandparents among the crowd. My specialty was supporting our adult children as they stepped into their new roles as parents, taking photos, and keeping a journal. The 13 families took a bus to a residential apartment complex and waited in a small conference room. Parents lined up, were handed their child, stood for a photo in front of the Chinese flag, and then found a spot so they could greet their child more privately. Most went outside to a small grassy area to talk and play. There is confusion, crying and little eye contact from Will to begin. One parent from each family must do paperwork. The Chinese call the day “Harmonious Time,” a time together before the adoption is complete. Will touched every leaf and flower he could reach. He loved the bus ride back to the hotel. Somewhere in the blur, I greeted him in English and fell instantly in love. The Chinese agency handling our grandson’s adoption advised parents to keep the babies in their hotel rooms the rest of the day so that they start bonding and get used to their non-Chinese faces. We were a phone call away and the reports we got were about his disinterest in a bottle and congee, a rice mixture that is his staple food. Will cried inconsolably for more 90 minutes then stopped, looked around and smiled. When we visited, he crawled on the bed and played. This traveling grandma got to do a lot of shopping because many of the clothes we brought for his 11-month-old body were too large. Finding clothes while using the wrong language skills was tricky but somehow successful. Each day in China had one mandatory event or meeting for the new families. We never needed a hospital visit but at least half of the group did for various temporary health problems for babies or parents. A favorite family destination in Kunming was a walk to an ancient Buddhist temple. One morning the group toured an Ethnic Village, what we’d call an amusement park in the states. Will’s favorite activity was a musical performance with Chinese music and dancers. As traveling moms know, proper equipment makes the days easier and in China that sometimes meant substituting a familiar, local baby bottle for one hauled over from the U.S. It also meant searching the alley stalls for a plastic dishpan that became an ideal baby bathtub but only after it doubled as an umbrella when a cloudburst interrupted the walk back to the hotel. The days were simple but full. It was all about bonding and schedules. Our suite became a destination for Will and his parents in the late afternoons. He demonstrated his ease moving around furniture. We’d treat it as if it were a stage performance on Broadway. We discovered new places for dinner and went out early because in Kunming not every restaurant has more than one high chair. Not getting a high chair was hardly a hardship. It simply meant we got to walk outside with Will while his parents ate their dinners. Before leaving Kunming, families visited the orphanage where the babies lived. Babies stayed on the bus or back in the hotel with one parent. No photos were allowed indoors but everything was clean and tidy. There was a separate building for special education services. Fifty percent of the children who live there are children with special needs. Departure from Kunming was facilitated by CCAI guides with love and care. They recited a farewell Chinese poem to wish the babies well in America, and they assisted with smooth passage through security. Not smooth though was the confusion of boarding passes alphabetized by first English names. Families wanting to sit together swapped seats assignments as best they could. Will bounced his way through this first flight of his life. I sat with a couple from Denver and got to hold their beautiful daughter briefly during the flight. After landing in Guangzhou, the heat and humidity were staggering and the baggage claim area was chaotic. Then we boarded a bus to the White Swan Hotel just 20 minutes away. Ask anyone who has adopted from China and you are likely to hear about the five-star White Swan. It is huge and ideal for the adoption groups. Among its features is a carpeted playroom without furniture. Mattel Corp. has filled it with toys. Cute, sweet, baby proof. American corporate resourcefulness provided hours of happy play. I got several invitations to babysit for Will while his parents went out (to the hotel lobby for a drink). I watched him sleep and thought about how lucky we all are to have him in our family. We were booked on one of the last flights out of that airport in Guangzhou. The next morning, the city’s new airport opened at a different location. The old airport was a mess. Most shops were closed. Merchandise was being moved to the new airport. Trash was in every corner. No food or drink was available. Will wriggled into his pajamas in the waiting room just before we boarded the late night flight. There was an empty seat between his parents on the flight so they created a little nest of blankets for him and he slept and ate well all the way back to Los Angeles. All Will’s papers – sealed before they were delivered to his parents with directions to have them opened only by officials when they reached the United States – were in order. Previous Post: « Zoorotic Adventures in Michigan?